Sean Fogarty's passion for food has led him to Chicago, France, the Sonoma Valley, and back to Wisconsin. In fact, you could say it was kindled in France. "My grandmother, Louisette, is a French native and made food a priority in our lives," says the Racine native. "She is a fantastic cook and I always loved going to my grandparents' house for dinner. Her brother was a chef who moved to the States to work, and I was alway enamored with him and his profession. I was also a hungry kid who loved to eat and always had a fascination with restaurants. When I reached working age, I took a job as a dishwasher at The Docks Restaurant, where the speed and excitement of the kitchen pulled me in. After a couple of years prepping and cleaning, I was given an opportunity to work the fryer and haven't looked back." 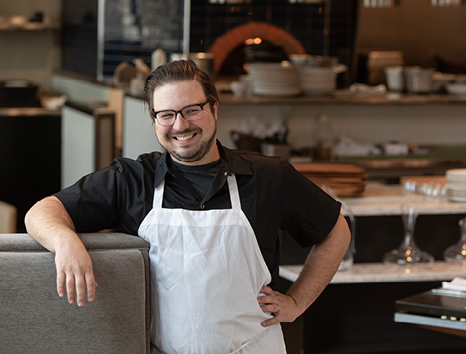 After that first restaurant experience, Sean moved to Chicago to attend culinary school at The Cooking and Hospitality Institute of Chicago, and worked in a North Side bistro. He then took his internship in France, where he stayed with family before moving to Madison and then back to Racine to finish his degree in English at UW-Parkside...working in restaurants the whole time. "While in Racine I met my wife Tricia," says Sean. "After our wedding we moved to Santa Rosa, California, so I could work at the Michelin-rated Cyrus in Healdsburg. After Cyrus I moved to Diavola Pizzeria and Salumeria, where my perspective of how food should be cooked and handled was solidified. If it weren't so far from family I might still be cooking there," adds Sean. "It is my life's work to make food taste that good with an uncanny sense of place." The couple moved to Madison "so Trish could finish school and because we both love this city and all it offers," says Sean. Always a Wisconsin boy, Sean enjoys spending time at home with his wife and son, watching the Packers, Brewers and Badgers, cooking, brewing beer, and golf. Of restaurant work, he loves the people first and foremost. "Restaurant people are honest, hard-working and always have a great sense of humor, says Sean. "We want to have fun and take everyone else with us. You always know you're cared for with restaurant people." What else does he love about his work? "Seeing the fruits of our labor come together everyday in a delicious and beautiful way," says Sean. "And eating...I'm still a hungry kid."